Local stocks were punished today by worsening signs of a US recession. 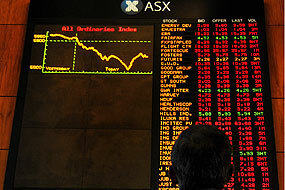 Wall Street took a dive on Friday and today the Australian share market followed suit, plummeting 2.3 per cent. Figures released on Friday show unemployment in the US in December rose to a higher than expected 5 per cent. The All Ordinaries Index closed 145 points lower to 6,240 and the ASX 200 also dropped 145 points to 6,161. Australian stocks fell, extending last week's decline, led by BHP Billiton Ltd. and Newcrest Mining Ltd. after prices for metals such as nickel, zinc and gold dropped on concern the U.S. housing slump is subduing consumer demand. National Australia Bank Ltd. led lenders lower after U.S. government reports on jobs and manufacturing added to concern the world's largest economy will sink into recession. Woodside Petroleum Ltd. declined along with the price of oil. The S&P/ASX 200 Index slid 145.20, or 2.3 percent, to close at 6,161.60 in Sydney, its lowest close in more than four months. It declined 0.5 percent last week and has lost 9.8 percent since reaching a record high on Nov. 1. Just six of the index's 201 stocks rose as 191 dropped today. BHP, the world's largest mining company and Australia's biggest oil producer, dropped 83 cents, or 2 percent, to A$40.02. Rio Tinto Group, the world's third-largest miner, lost A$2.90, or 2.2 percent, to A$129.17. Zinifex Ltd., the world's third-largest zinc producer, slid 86 cents, or 7.1 percent, to A$11.32. Oxiana Ltd., an Australian gold and copper miner, slipped 13 cents, or 3.5 percent, to A$3.60. A measure of six metals traded on the London Metal Exchange, including copper and nickel, lost 1.6 percent. Copper fell 0.9 percent, nickel dropped 2.6 percent, and zinc declined 3.1 percent. Newcrest Mining Ltd., Australia's largest gold miner, declined 79 cents, or 2.1 percent, to A$36.22, after jumping 15 percent last week, its biggest weekly gain in almost four months. Lihir Gold Ltd., a Papua New Guinea-based gold miner, weakened 18 cents, or 4.6 percent, to A$3.73. Gold dropped on speculation a rally to the highest price since 1980 last week was overdone. It fell 0.7 percent to $859.60 an ounce in after-hours trading on the Comex division of the New York Mercantile Exchange. National Australia Bank, the country's biggest bank, slid A$1.03, or 2.8 percent, to A$36.30. Commonwealth Bank of Australia, the second-largest, fell 84 cents, or 1.5 percent, to A$57.20. Macquarie Group Ltd., the nation's largest securities firm, slipped A$1.81, or 2.5 percent, to A$71.39. Babcock & Brown Ltd., Australia's second-biggest investment bank, dropped A$1.05, or 4.1 percent, to A$24.50. The U.S. stock market got off to its worst start since 2000 last week. The Standard & Poor's 500 Index slipped 2.5 percent on Jan. 4, wiping out its gain from last year. U.S. payrolls grew by 18,000 last month, about one-quarter the rate forecast by economists, and unemployment increased to 5 percent, the Labor Department said Jan. 3. The Institute for Supply Management's manufacturing index dropped to 47.7, the lowest since April 2003. The Jan. 2 report, combined with a rise in the price of oil to a record $100 a barrel, spurred concern that the housing recession and slowdown in spending will halt the six-year expansion in the world's biggest economy. Woodside Petroleum Ltd., Australia's second-biggest oil producer, declined 80 cents, or 1.5 percent, to A$51.37. Santos Ltd., the third-biggest producer, lost 25 cents, or 1.7 percent, to A$14.55. Crude oil for February delivery recently slid 0.6 percent to $97.31 a barrel in after-hours trading on the New York Mercantile Exchange. It reached a record $100.09 a barrel last week. The S&P/ASX 200's futures contract for March plunged 2.4 percent to 6,188. 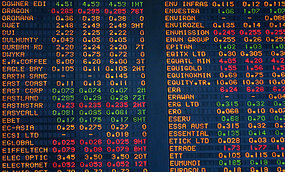 The broader All Ordinaries Index dropped 2.3 percent to 6,240.40. The following stocks rose or fell. Stocks symbols are in brackets after company names. Boart Longyear Ltd. (BLY AU), a provider of drilling services to mining companies including BHP, added 5 cents, or 2.2 percent, to A$2.35. Boart bought Patagonia Drill, an Argentinian minerals exploration drilling services provider, in a deal that will add more than $11 million in revenue to Boart, according to a statement to the exchange. Patagonia owns 13 drill rigs and is an industry leader in diamond drilling, Boart said. Centro Properties Group (CNP AU), the Australian owner of U.S. malls that last week put itself up for sale for failing to refinance debt, slipped 8.5 cents, or 6.6 percent, to A$1.20. Centro said Jan. 4 it has been unable to extend its interest rate hedges and that this may cut earnings, according to a statement to the exchange. Energy Resources of Australia Ltd. (ERA AU), producer of more than a 10th of the world's mined uranium, lost 53 cents, or 2.8 percent, to A$18.49. Energy Resources will not suffer any loss of production after a cyclone at its Ranger mine in Australia's Northern Territory impeded operations, company spokeswoman Libby Beath said yesterday. Energy Resources evacuated staff and suspended the use of trucks during Tropical Cyclone Helen, although it was able to continue milling ore during the storm. Monitor Energy Ltd. (MHL AU), which explores for oil and gas in the Kyrgyz Republic, jumped 0.7 cent, or 26 percent, to 3.4 cents. Suzie Foreman resigned from the role of company secretary and Martin Stein was appointed in her place, according to a statement to the exchange. Ocean Capital Ltd. (OCE AU), a beach resort operator, climbed 3 cents, or 5.1 percent, to 62 cents. Ocean said it received development approval from the Whitsunday Shire Council to expand its Long Island Resort in the region. The permit allows Ocean to build an additional 162 guest rooms and 58 staff accommodation units as well as new recreational facilities, according to a statement to the exchange. Qantas Airways Ltd. (QAN AU), Australia's biggest airline, lost 16 cents, or 2.9 percent, to A$5.28. The company increased its international fuel surcharge on international flights after crude oil last week surpassed $100 a barrel for the first time. Its engineers are also planning to take industrial action Jan. 9 after wage negotiations ended without agreement last week, the Australian Financial Review reported. Valad Property Group (VPG AU), an Australian property developer, declined 6.5 cents, or 5.2 percent, to A$1.18. Valad said it raised 90 million euros ($133 million) via its Nordic Aktiv Fund and that the money will be used to invest in light industrial real estate in Denmark, Finland, Norway and Sweden. Bassari Resources Ltd debuted on the Australian Securities Exchange 1.5 cents above its 25 cent-a-share issue price. Bassari operates mainly in Senegal, in West Africa, covering the Birimian greenstone gold belt which extends, too, into Mali and Guinea. Coffey International Ltd has bought US-based Management Systems International Inc to build critical mass in the international development consulting market. Coffey said it would pay about $US25 million, or about $A28.4 million, for the company. Oil and gas explorer Nexus Energy Ltd has secured a tanker and $50 million in funds to advance the Crux project in the Timor Sea. Nexus has been issued $50 million in funding from the Bank of Scotland International Ltd, which will be applied to the drilling costs of two wells. Westfield Group is to move back into retail on the site of the World Trade Centre in New York, signing a letter of intent which could lead to investment of $US625 million in development costs on a $1.45 billion retail project. Total sales and same store sales for The Warehouse in November and December were relatively flat compared to the corresponding period last year, The Warehouse Group reported today. Group net profit after tax for the first half of the financial year ending January 27 was expected to be similar to the $NZ60.1 million ($A52.89 million) in the corresponding period last year. Rio Tinto Ltd is believed to be considering making a bid for Canadian uranium explorer Xemplar Energy. The Anglo-Australian miner is reported to have become interested in Xemplar after it revealed it had discovered what is believed to be one of the world's biggest uranium deposits in Namibia. Zinc miner Zinifex Ltd says Allegiance Mining NL's flagship project in Tasmania will require significant funding to realise its full potential, calling on the nickel hopeful's shareholders to accept a takeover offer.